Dustcovers protect interlocks from their environment. Offered in standard and padlocked versions, Dustcovers fit over mGard industrial safety interlocks to prevent build up of dust and debris that could prevent internal mechanism from operating properly. 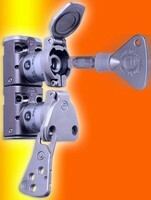 Stainless steel products are spring-loaded and feature internal clamp that grips lock body. Designed to fit CL(S), ML(S), and BL(S) locks, covers can be mounted vertically or horizontally and offer polished front surface that provides room for text. Fortress has introduced new Dustcovers for use with its mGard range of industrial safety interlocks. The Dustcovers are available as standard or padlockable and fit over the lock preventing build up of dust and debris that could prevent the internal lock mechanism operating correctly. Designed to fit the CL(S), ML(S), BL(S) locks, the Dustcovers are stainless steel and spring loaded, featuring a robust clamp inside that grips the lock body. They can be mounted either vertically or horizontally and the large polished front surface provides room for customer text. Padlockable Dustcovers are available featuring two padlock holes that accept padlocks from 3-8mm and are also compatible with Fortress scissor hasps with multiple padlockable holes. This extra lock-out feature prevents any un-authorised operation of the lock whilst keeping the interlock free from debris and in good working order.